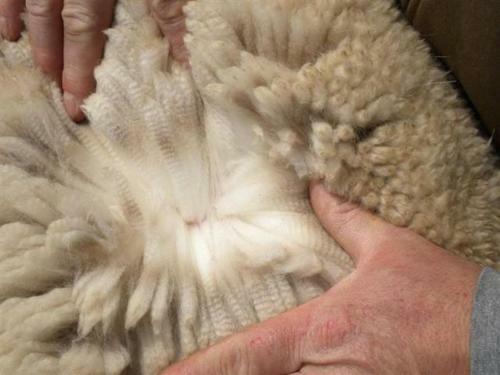 2011 shearing - 5.5# blanket! Over 10# total! WOW!! Breed 7x champ to your colors! Status's fleece continues to take Judge's Choice in Fleece Shows - even as a 9 year old male! Complimenting the fleece, w/him being almost 10 years old, he is a big, bold, white Peruvian Male with Crimp, Density, and great conformation and personality. If you put your hands on him and meet him face to face you will absolutely fall in love with him. "Princess Pearl" as she is known around the farm, carries the unique blending of My Peruvian Justice (an Augusto son) and Dewey Meadows Linen (a Dewey Meadows Woolite daughter). Both of these parents and grandparents are multiple blue ribbon and championship winners. Pearl has a very typey head and dense, yet fine fiber. Her conformation is flawless, movement fluid and correct, and her fiber is divine. 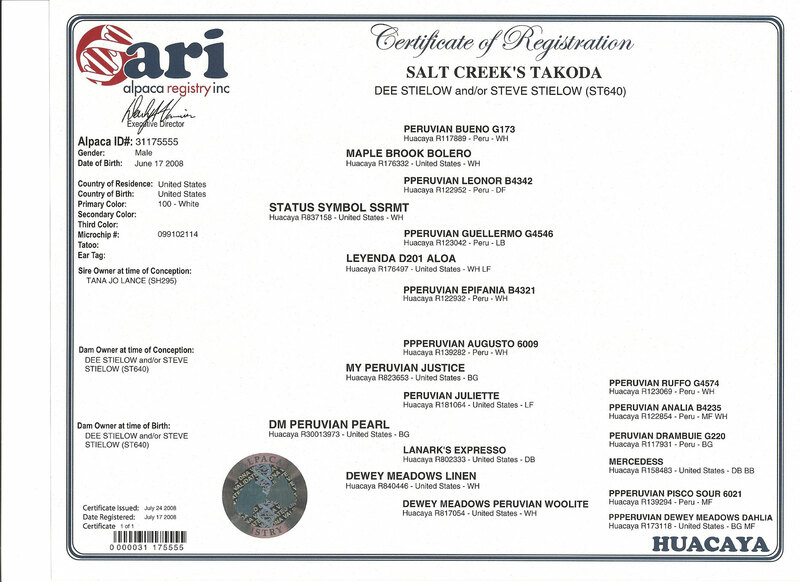 Pearl continues to win in spin-off competitions and the show ring. 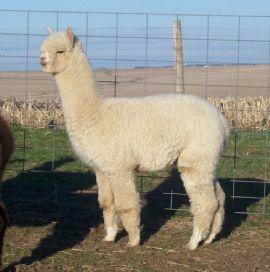 Look for her and her dark fawn 1/2 sister's (DM Peruvian Sahara), offspring in the show ring! 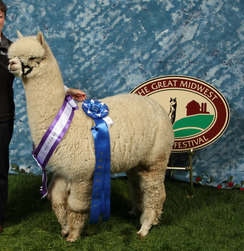 7x halter Champion, Takoda, clearly holds his own in the sea of "white". But did you realize you can enhance your colored girls by breeding to an animal with such amazing fleece statistics like Takoda?? His histograms tell the story - consistency, fineness, amazing handle - even as a three year old! Don't be shy - breed him to your fawns and browns! Or whites... But get those fiber characteristics your breeding program is striving for!! One of the most fascinating aspects of Takoda is that he clearly continues to impress the judges and customers as he matures. He has found a unique way to combine the genetics of his ancestors into his perfectly formed stature, fiber, bite, and attitude as he casually strolls into the show ring or through the pastures at home. He is the king. A calm, yet "I'm in charge here" attitude reigns as soon as he appears. 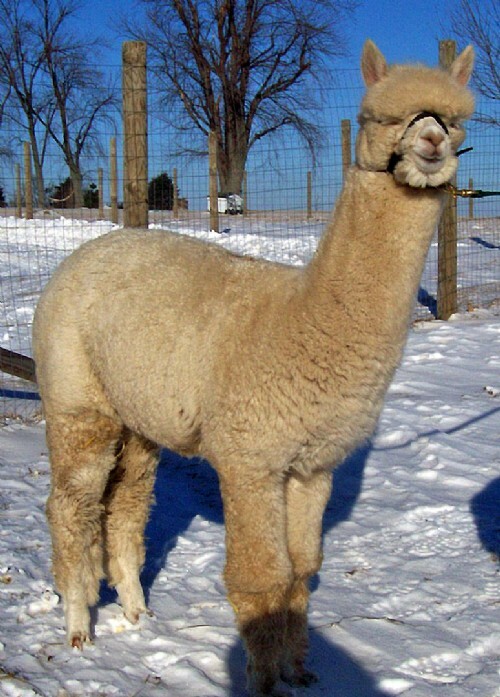 The other alpacas know it. We aren't sure if he gets it from Augusto, Drambuie, Bueno...who? We just don't know...but we like it! Takoda hasn't just taken a championships as a juvenile - he has continued to take the coveted banner as a yearling and a 28 month old. As he grows and develops, we are proud that he remains a strong contender. Most impressive is the other males he has beaten - some equally impressive males that he has managed to edge out. Clearly - a simply incredible and irresitible male Takoda certainly has matured to become. A strong, sturdy, robust, powerful frame holds the most wonderful, soft, crimpy, consistant, bright white fiber you will find. AWESOME. All breeders know that the white class is highly competitive and it should be. 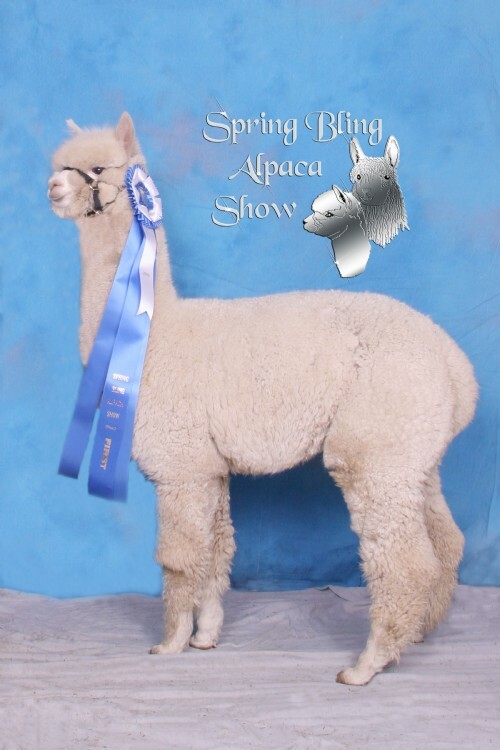 Serious breeders understand that as the alpacas develop and mature, the studs which are worthy breeding to will remain at the top. Takoda is one of these males. Watch him at shows. Listen to the judges comments about him. Visit him at his home and at shows. Talk to us about him. Feel his fiber. Observe his attitude. This is one set of genetics you want added to your herd!